- All round Wi-Fi connectivity guarantees a perfect working environment to all our business residents. - Instant water heaters and pressurized sanitary system and tender touch linen and beddings. Located in the heart of Nairobi City along the bustling River Road, Hotel Kipepeo is close to the city's main train station and a 10-minute walk from Kenyatta International Conference Centre. This is a good clean budget hotel in the heart of the capital. The rooms are of high quality and there is Wi-Fi throughout the building as well as 24-hour security and CCTV cameras in all public areas. There is a small courtyard in the centre of the building where guests can enjoy coffee or a snack from the restaurant. 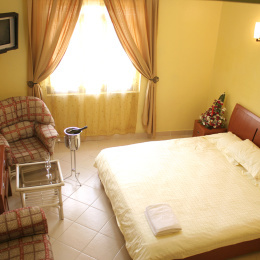 Hotel Kipepeo offers 56 accommodation options with washers/dryers and welcome amenities. Rooms feature city or courtyard views. Hotel Kipepeo has a fabulous restaurant offering a variety of excellent dining experiences in truly delightful settings. An emphasis is placed on gourmet dining. Whether you require fine dining for a few or a lavish banquet, our experienced staff will provide a variety of menus and exceptional service. The hotel has two restaurants that serve breakfast, lunch and dinner. 24-hour room service is available. The menu offers a wide variety of international meals. A bar is on site where guests can unwind with a drink. Business amenities consist of a business centre, secretarial services and town car service.